SABA North America Conference's Steering Committee is hosting a Meet & Greet on Sunday, February 24, 2019 from 4-6pm at Amara. Drinks and light bites will be provided by SABA North America. Stop by and learn more about the upcoming National Conference! SABA North America is pleased to return to Washington, D.C. for its 3rd Annual Lobby Day this March 12-13, 2019. Members from across the country will gather to gain a deeper understanding of the issues that affect the South Asian community and then meet with key Members of Congress and their staffs to educate them on those issues. It is our chance to make our voices heard with the people who make our laws. Jana Anandarangam from our local chapter will be there - will you?! Come mingle with your fellow members at the SABA-GA Annual Holiday Party! Tickets include complimentary beer/wine and appetizers. If you have any questions, please contact us at sabaga13@gmail.com. We look forward to seeing you all at the party! Buy Your Tickets Here! Save the Date for Atlanta! 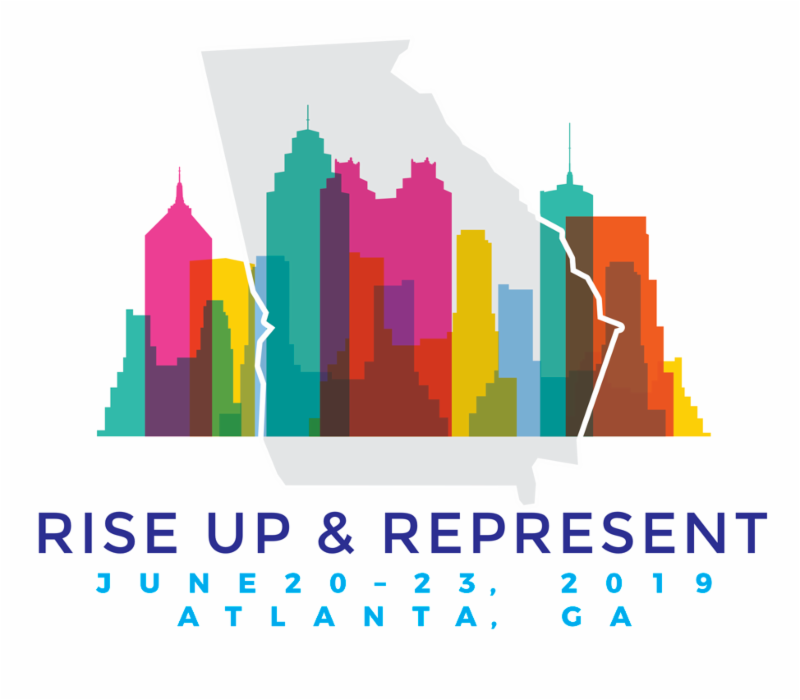 Join us next summer in Atlanta as we Rise Up and Represent the South Asian legal community! Save the date for the 2019 SABA Conference from June 20-June 23. For more information, see our website. Feeling proactive? Book your room at the W Midtown now and guarantee your place in the center of the action. If you'd like to shape the content at our annual Conference next summer in Atlanta, this is your chance! We're accepting ideas for a variety of panels and presentations that will appeal to both the newly minted attorney and our more experienced members. Click the button below to submit your panel ideas by November 26. This is the best way to make sure that the panels you want are the ones that we present. If you have questions about what or how to submit, please contact Jana Anandarangam or Anjula Singh. 4th Annual Charity Dinner TONIGHT! SABA-GA Members should have already received an e-mail with a discount code! Please e-mail sabaga13@gmail.com with questions about the code. 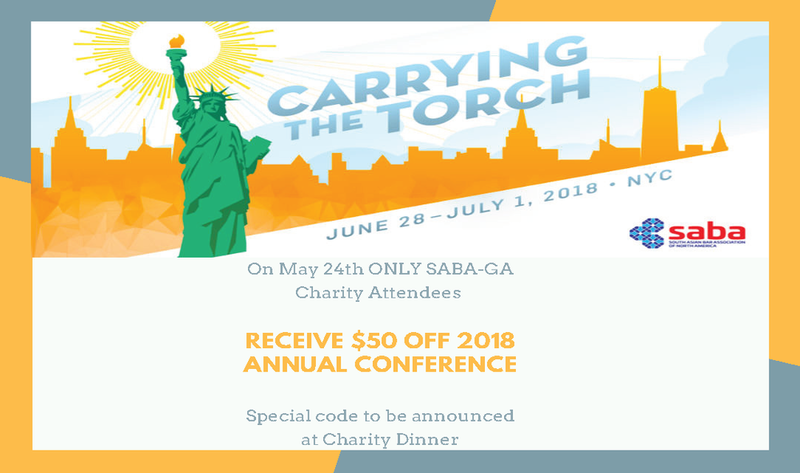 Banquet attendees will also receive a discount code to register for the 15th Annual SABA National Convention being held in New York City from June 28 - July 1, 2018! SABA-GA is looking for volunteer attorneys to help with the clinic. Please let us know by clicking here if you are available and willing to assist, or if you have any questions about the clinic! It's a very small time commitment that will lead to a very large impact!! We are pleased to announce that our keynote speaker for the evening will be Susan P. Coppedge who currently serves as United States Ambassador-at-Large to Monitor and Combat Trafficking in Persons. 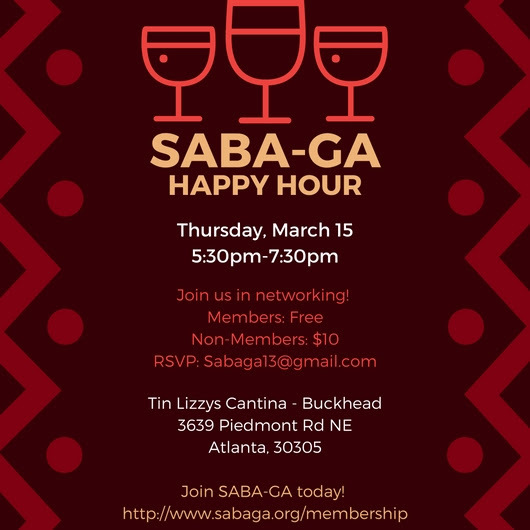 Join us for an evening of marketing at SABA-GA's first Happy Hour of 2018! Since 2009, the YLD has been at the forefront of the fight to combat decreases in both young lawyer employment opportunities and staffing at Georgia's public interest legal organizations. Through the Public Interest Internship Program (PIIP), the YLD has, over the past eight years, made it possible for 36 young lawyers and law students to pursue internships at Georgia's public interest legal organizations. These 36 PIIP interns have provided approximately 14,000 hours of service to Georgians in need of legal services that they otherwise could not afford. Providing legal services to the indigent remains a critical need in Georgia and is one of the focuses of the State Bar's strategic plan. The need for PIIP is as great now as it has ever been. As a result, I am happy to announce that the YLD is now accepting applications for the 2018 class of PIIP interns. Any law student or new lawyer who has already secured a summer internship for at least 10 weeks and 400 hours of service at a public interest legal organization in Georgia can apply for a PIIP internship and the $5,000 stipend that accompanies it. Applications will be vetted by the YLD Public Interest Internship Program Committee, with the applicants ranked based upon their ties to the state of Georgia and commitment to public service, essay, strength of resume and extracurricular activities. Apply here. Applications are due no later than March 30 at 5 p.m.
Won't you seize this opportunity to assist the YLD in its efforts to combat the ongoing shortage of legal employment opportunities for young lawyers and aid in the delivery of legal services to the millions of Georgians in need of them by applying for a PIIP internship? 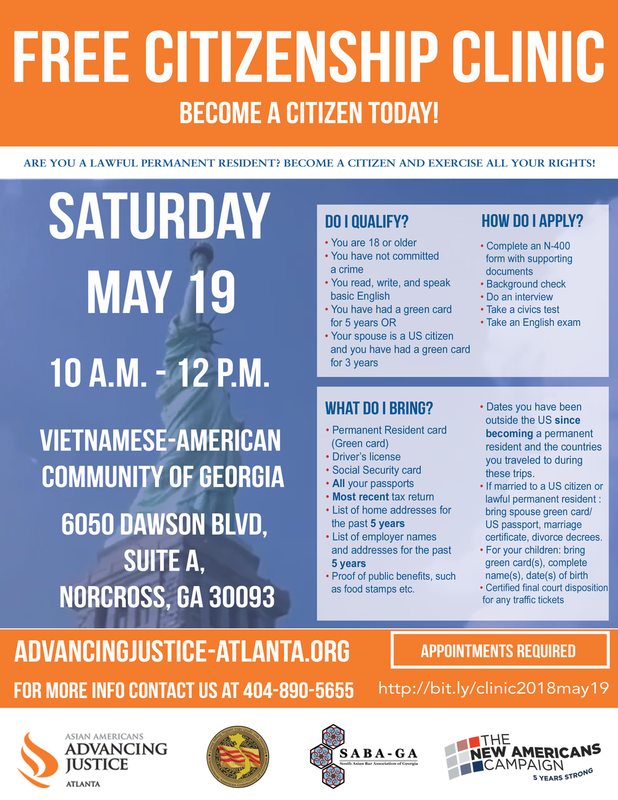 Asian American Advancing Justice is hosting their Seventh Annual Asian American Legislative Breakfast and Lobby Day on Thursday, February 22 in the Georgia State Capital located in downtown Atlanta. Our Legislative Breakfast and Lobby Day is designed to be a relationship-building opportunity among Asian American leaders, Georgia elected officials and other policy makers. 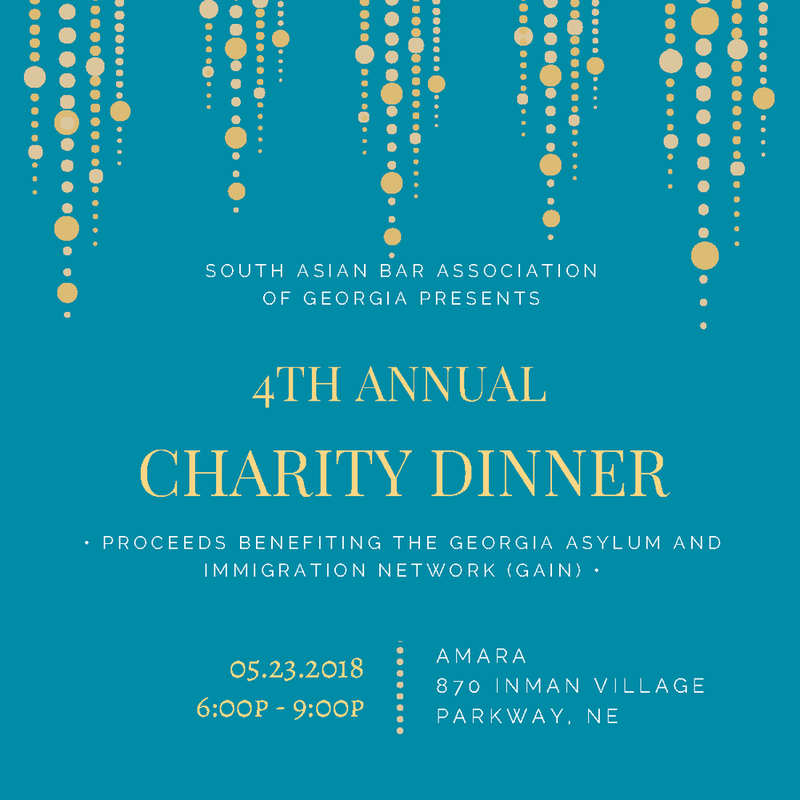 Our event draws the largest number of Asian American business and community leaders to the Georgia Capitol each year, typically bringing together over 300 guests. This year's event will start with coffee and refreshments as well as a formal program at the Floyd Room at the James H Floyd Building from 7:30AM - 9:00AM, followed by an opportunity to lobby elected officials on important issues in the legislature. Guests will be invited to join us back in the Floyd Room for a lunch and keynote address (TBD). Please join us in congratulating the new Board of Directors. We thank everyone that took the time to vote and thank each member who ran for the board of directors. We would also like to extend our gratitude and appreciation for the outgoing board of directors Akash Desai, Zain Kapadia, and Sonia Lakhany. SABA-GA has four vacancies for board member positions starting in 2018. If you are interested in nominating someone or running, please fill out the nomination form. Details on eligibility and nominating are listed on the form. Forms are due no later than Thursday, January 11. The election meeting will be held on Thursday, January 25, 2018 at the offices of Kilpatrick, Townsend & Stockton, located at 1100 Peachtree St NE, Atlanta, Georgia 30309. The meeting will begin at 6pm. All members are welcome to attend. Want to contribute to SABA but aren't sure about the three year time commitment? There are other ways to get involved! We are in searching for one individual to serve as the Co-Chair of Programming for the National Convention this year in NYC. If you are interested or have any questions, please email sabaga13@gmail.com. SABA-GA will be forming an advisory committee comprised of previous board members who can get involved who can be a voice with regards to our local chapter as well as have input in the 2019 National Convention. All previous board members are encouraged to apply. If you are interested or would like to nominate someone, please email sabaga13@gmail.com.